As Ilhas Falkland consiste em um grupo compacto de 778 ilhas situadas a 400 milhas do extremo sudeste da América do Sul. As principais ilhas são a Ilha Falkland do Leste e a do Oeste. Elas são lembradas mundialmente devido a Guerra das Malvinas (são chamadas assim pela Argentina) em 1982. 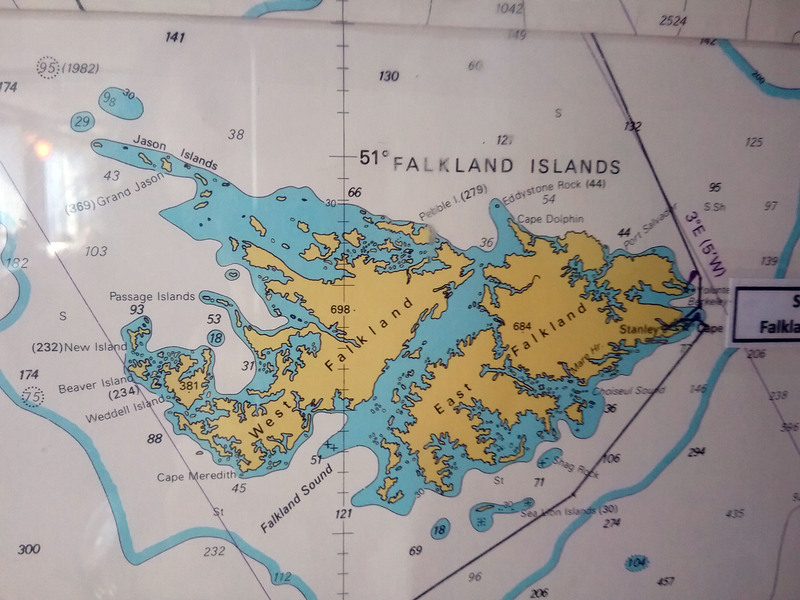 A primeira imagem que tive das Ilhas Falkland foi de uma paisagem cinzenta com casas de madeira com telhados coloridos. Senti uma grata surpresa ao encontrar uma pequena cidade limpa e organizada. Port Stanley é a capital da ilha e possui quase 3000 habitantes. Tem um governador e é controlada pelo Reino Unido. Quando você visita o lugar, se tem a impressão que se está em uma pequena cidade do interior do Reino Unido, com suas habitações típicas, cabine telefônica vermelha (como em Londres) e até mesmos com os famosos “pubs” (bares) ingleses. As principais atrações turísticas das ilhas são os atrativos naturais, pode-se observar a fauna silvestre e fazer belas caminhadas onde se aprecia paisagens deslumbrantes como a Baía do Surf, a colônia de pinguins (somente no verão) na Baía dos Ciganos. Por falar em pinguim, a palavra está presente de forma acentuada na vida dos nativos, tem até um jornal chamado “Penguin News”. Mas, voltando aos atrativos da ilha e continuando com o assunto pinguim, alguns dos lugares onde você pode ver os mesmos: Bluff Cove Lagoon, Volunteer Point (ambos na East Falkland),Rockhopper são lugares onde você pode ver diferente tipos de pinguins. 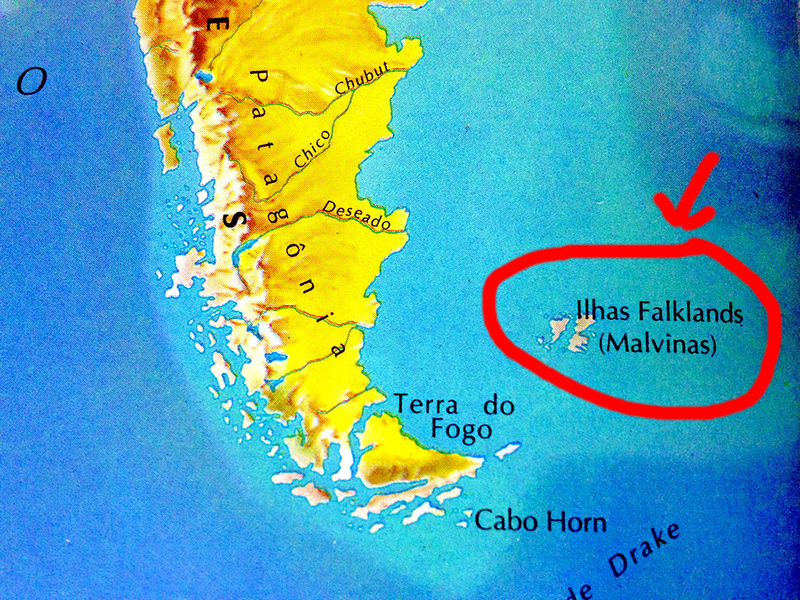 Nas Ilhas Falkland é possível ver, na época apropriada, os pinguins das espécies King, Gentoo, Rockhopper, Magellanic, Macaroni. Os principais atrativos em Port Stanley são: Igreja Cristã e o Arco de Osso da Baleia, o Museu de História Dockyard, onde existem relíquias marítimas. A área do porto é a parte onde se encontra lojinhas, cafés, bares e restaurantes. Nas Ilhas Falkland é possível se pescar salmão e truta. Há também campos de golfe. Além disso, há uma maratona no mês de março, jogos nos campos de golfe, pesca de salmão e truta. Fiz uma caminhada onde foi possível observar uma vegetação diferente, com caminhos floridos (era verão) e ladeados por belos cenários, além de observar ninhos com pinguins recém-nascidos. Quem pensa em visitar as Falklands deve levar roupas que protejam do vento, mesmo no verão, senti necessidade disso. Para se chegar nas Ilhas vindo da América do Sul, é necessário voar de Santiago com escala em Puntarenas, no Chile. O voo demora 6 horas e é operado pela Lan Chile. Die Falkland-Inseln bestehen aus einer kompakten Gruppe von 778 Inseln 400 Meilen südöstlich von der Spitze Südamerikas gelegen. Die Hauptinseln sind die Inseln Ost-Falkland und West-Falkland. Sie sind weltweit wegen des Falkland-Krieges im Jahr 1982 bekannt (Guerra das Malvinas so von Argentinien genannt). Das erste Bild, das ich von den Falklandinseln hatte, war eine graue Landschaft mit Holzhäusern mit bunten Dächern. Ich empfand es als eine angenehme Überraschung, eine kleine, saubere und organisierte Stadt vorzufinden. Port Stanley ist die Hauptstadt der Insel mit fast 3.000 Einwohnern. Es gibt einen Gouverneur und ist vom Vereinigten Englischen Königreich kontrolliert. Wenn Sie den Ort zu besuchen, haben Sie den Eindruck, dass Sie sich in einem kleinen Ort in Großbritannien befinden mit seinen typischen Häusern, den roten Telefonzellen und sogar auch den berühmt-typischen “Pubs”. Die wichtigsten touristischen Attraktionen der Inseln sind die Attraktionen der Natur, Sie können Wildtiere beobachten und schöne ausgedehnte Spaziergänge machen mit atemberaubender Landschaft wie z.B. die Bucht „Baia de Surf“, einer Pinguinkolonie (nur im Sommer) oder die Bucht “Baía dos Ciganos“. Apropos Pinguin, das Wort ist allseits präsent im Leben der Einheimischen, z.B. gibt es die Zeitung namens “Penguin News”. 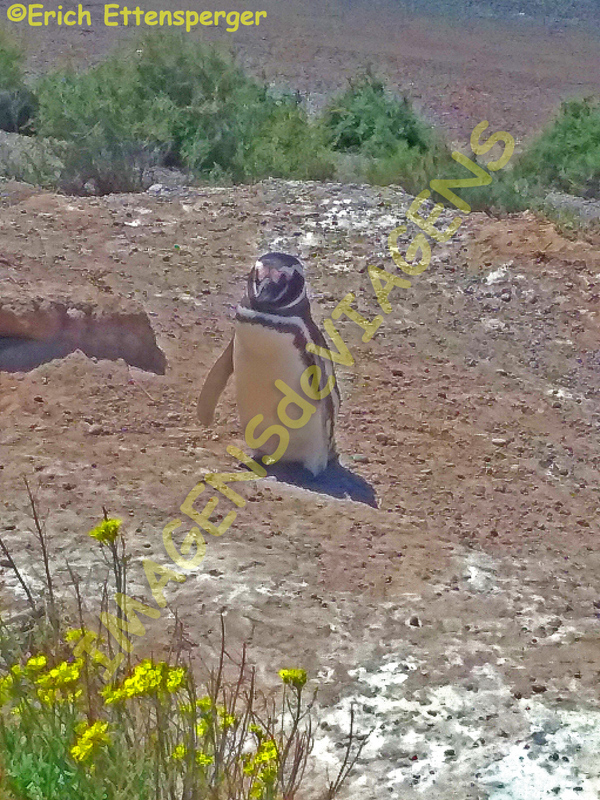 Aber zurück zu den Attraktionen der Insel und weiteren Infos zum Thema Pinguin: Bluff Cove Lagoon, Volunteer Point (beide in Ostfalkland), sind Orte, wo man verschiedene Arten von Pinguinen beobachten kann. Auf den Falkland-Inseln können Sie zu gegebener Zeit, die Pinguine der Spezie King, Gentoo, Rockhopper, Magellanic, Macaroni observieren. Zu den wichtigsten Sehenswürdigkeiten in Port Stanley zählen: die Kirche Christian Church und der Wal-Knochen-Bogen und das Dockyard History Museum mit maritimen Reliquien. Der Hafen ist der Bereich mit Geschäften, Cafés, Bars und Restaurants. Auf den Falklandinseln ist es möglich, Lachse und Forellen zu angeln. Es gibt auch Golfplätze. Außerdem gibt es im März einen Marathon und Spiele auf den Golfplätzen. 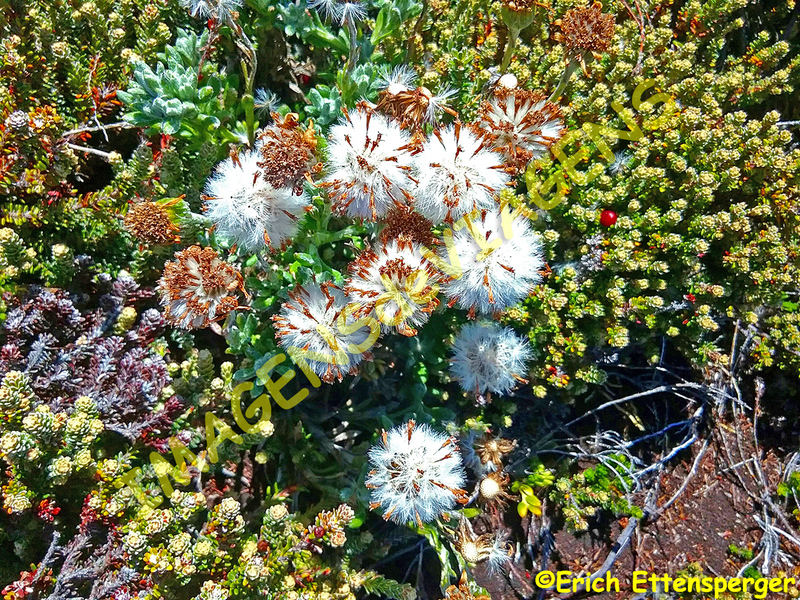 Auf unserem langen Spaziergang war es möglich eine für uns ganz andere Vegetation zu beobachten, Pfade in voller Blüte (es war Sommer) flankiert von einer wunderschönen Landschaft, zusätzlich konnten wir Nester mit neugeborenen Pinguinen beobachten. 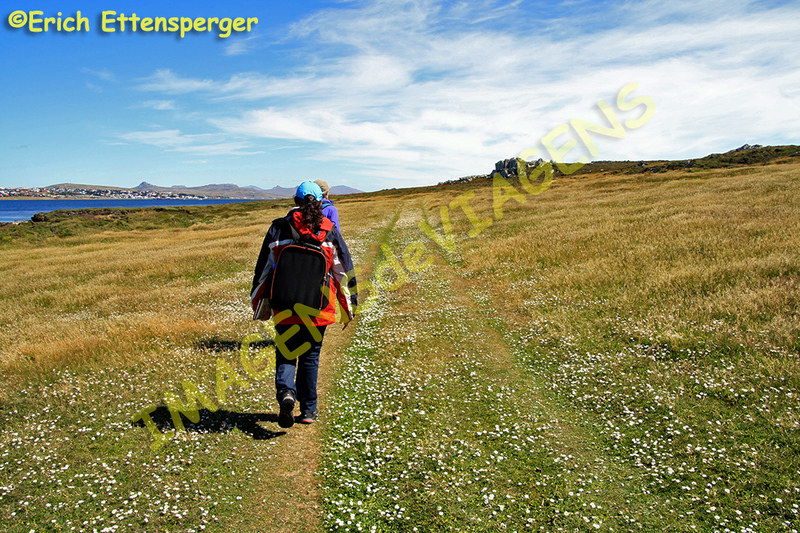 Jeder, der daran denkt, die Falkland-Inseln zu besuchen, sollte Kleidung mitbringen, die vor dem allgegenwärtigen Wind schützt, auch im Sommer!! Die Inseln von Südamerika aus erreichen Sie von Santiago aus mit Zwischenstop in Puntarenas, Chile. Dieser Flug von Lan Chile dauert 6 Stunden. The Falkland Islands consists of a compact group of 778 islands located 400 miles southeast of the tip of South America. 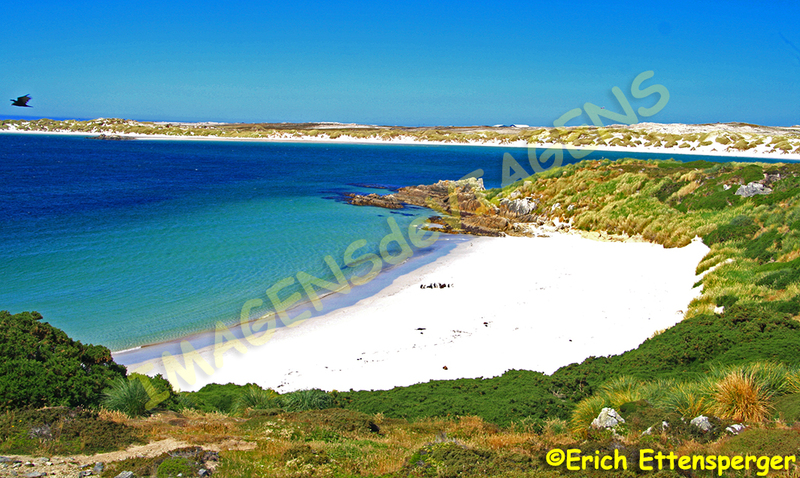 The main islands are East Falkland Island and the West Falkland Island. They are remembered worldwide due to the Falklands War in 1982 (also called Guerra das Malvinas by Argentina). 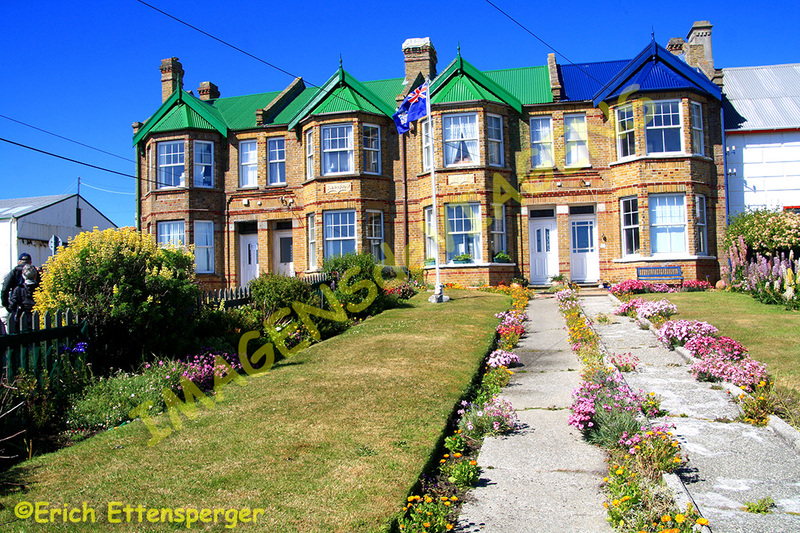 The first image I had of the Falkland Islands was a gray landscape with wooden houses with colorful roofs. I felt a pleasant surprise to find a small clean and organized city. Port Stanley is the capital of the island and has almost 3000 inhabitants. 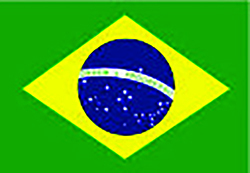 It has a governor and is controlled by the United Kingdom. When you visit the place you have the impression that you’re in a small town in the UK, with its typical houses, red telephone booth and even with the famous typical “pubs”. The main tourist attractions of the islands are the natural ones, you can observe wildlife and make beautiful walks where you enjoy breathtaking scenery as the „Bay of Surf“, the penguin colony (in summer only) and the Bay „Baía dos Ciganos“. Speaking about penguin, the word is strongly present in the life of the natives, even has a newspaper called “Penguin News”. 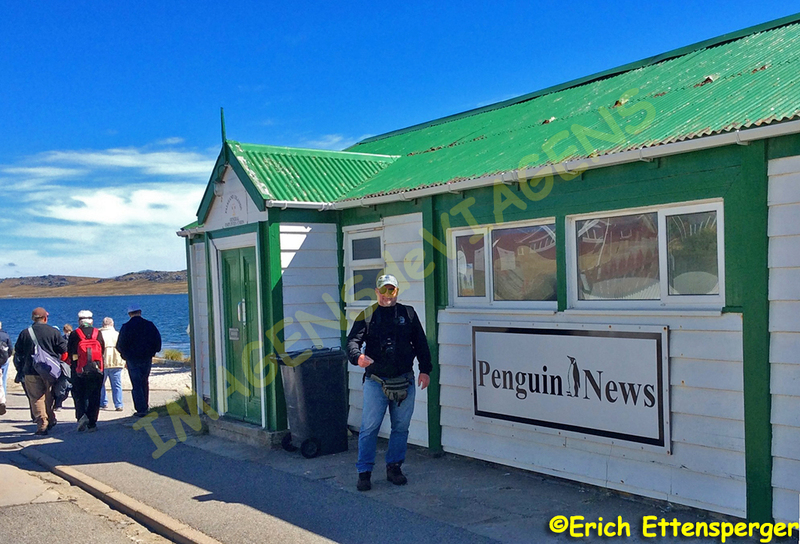 But back to the attractions of the island and continuing with the Penguin subject, some of the places where you can see them: Bluff Cove Lagoon, Volunteer Point (both in East Falkland) and Rockhopper are places where you can observe different types of penguins. On the Falkland Islands you can see at the appropriate time the penguins of the species King, Gentoo, Rockhopper, Magellanic, Macaroni. The main attractions in Port Stanley are: Christian Church and the Whale Bone Arch and the Dockyard History Museum, where there are maritime relics. The harbor area is the part with shops, cafes, bars and restaurants. on the Falkland Islands it is possible to fish for salmon and trout. There are also golf courses. Also, there is a marathon in March and games on the golf courses. I took a walk where and it was possible to observe a very different vegetation with flowering paths (it was summer), all flanked by beautiful scenery, in addition it was possible to observe nests with newborn penguins. Anyone thinking of visiting the Falklands should take clothes to protect from the wind, even in the summer, you need that. To reach the islands from South America, it is necessary to fly from Santiago with stopover in Puntarenas, Chile. The flight takes 6 hours and is operated by Lan Chile. Nós agradecemos pelas palavras João Paulo!Esperamos que um dia você possa visitar esse paraíso da natureza e apreciar suas belezas! Abraços!